PA TV distorted a photo of victims murdered in a Nazi concentration camp and presented them as Arab victims of Jews in 1948. 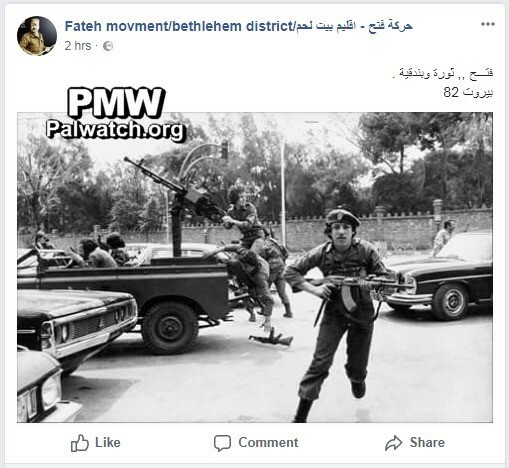 “The Fatah Movement’s Jenin branch, in cooperation with [Fatah’s] Jenin region leadership, held the third coexistence camp under the title Martyr Abu Jihad Camp (i.e., terrorist, responsible for murder of 125), and this was at the [PA] National Security [Forces] camp Horsh Al-Saada. Abu Jihad (Khalil Al-Wazir) – was a founder of Fatah and deputy to Yasser Arafat. He headed the PLO terror organization’s military wing and also planned many deadly Fatah terror attacks in the 1960’s – 1980’s. These attacks, which murdered a total of 125 Israelis, included the most lethal in Israeli history – the hijacking of a bus and murder of 37 civilians, 12 of them children. 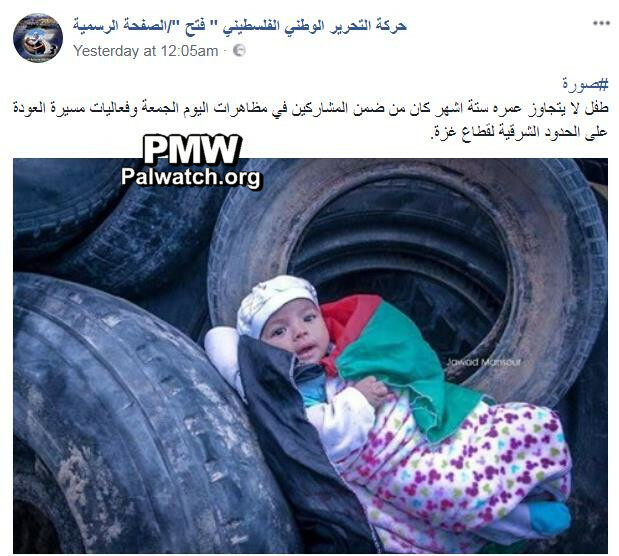 The image shows a baby wrapped in a Palestinian flag lying on top of a pile of tires. The tires were burned by the Gaza border as part of massive violent protests. “Prisoner Thabet Azmi Suleiman Merdawi, 42, from the village of Araba south of Jenin, began his 17th consecutive year in the occupation’s prisons yesterday, Thursday [April 5, 2018]. Thabet Merdawi – leading member of the Palestinian Islamic Jihad in Jenin who planned at least 9 terror attacks that murdered 20 Israelis and wounded 150 in 2001-2002: Binyamina train station suicide bombing (July 16, 2001, 2 murdered), Kibbutz Shluhot suicide bombing (Oct. 7, 2001, 1 murdered), Hadera Market shooting attack (Oct. 28, 2001, 4 murdered), Wadi Ara suicide bombings (Nov. 29, 2001, 3 murdered, and March 20, 2002, 5 murdered), Afula central bus station suicide bombing (March 5, 2002, 1 murdered). Merdawi turned himself in to Israeli security forces on April 11, 2002, during the Israeli military operation Defensive Shield. He was convicted and sentenced to 21 life sentences and 40 years. The image shows men in military uniform armed with assault rifles on the back of a truck, which has a mounted heavy machine gun on it. 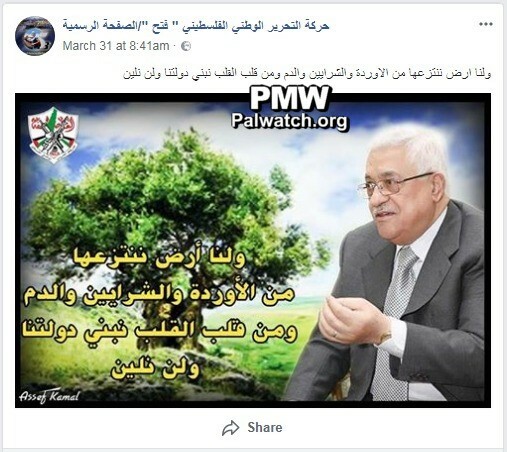 The image shows PA Chairman Mahmoud Abbas and a tree in the background; in the upper left corner is the Fatah logo that includes a grenade, crossed rifles, and the PA map of “Palestine” that presents all of Israel as “Palestine” together with the PA areas. 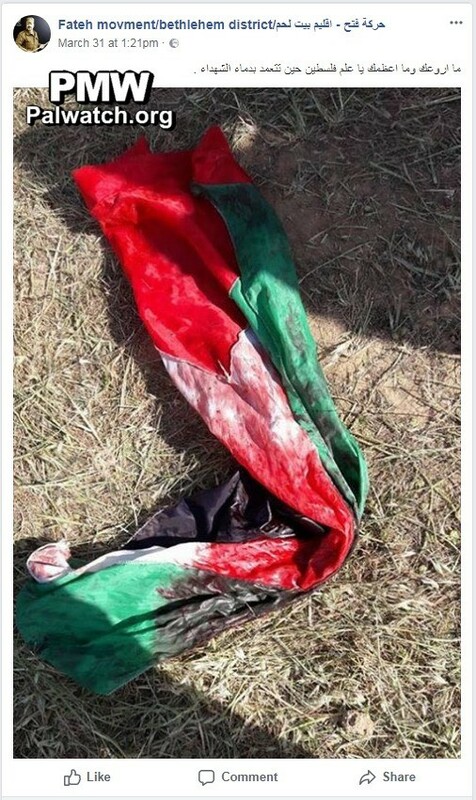 The image shows a bloodied Palestinian flag lying on the ground. 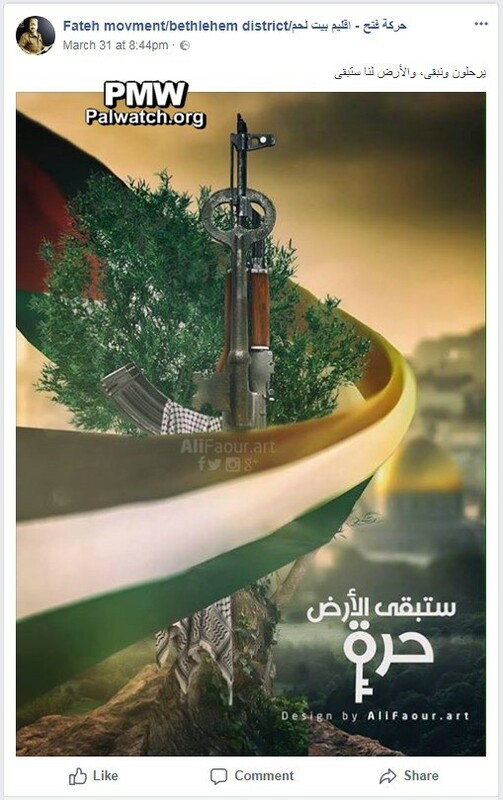 The image shows a Palestinian flag around a tree, and above the flag is an AK-47 assault rifle with a key symbolizing the “return” of the Palestinian refugees hanging on it and a keffiyeh (Arab headdress) draped over its ammunition magazine. In the background is the Dome of the Rock. 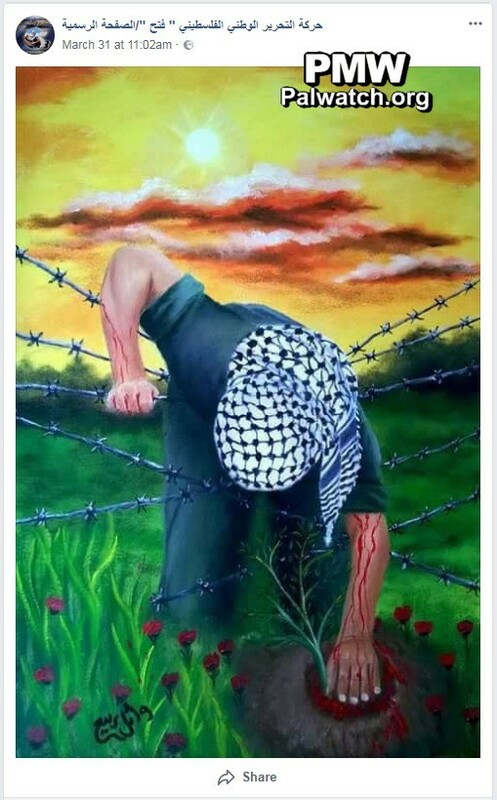 The image is a drawing of a man in a keffiyeh (Arab headdress) leaning over barbed wire and planting a flower with his bleeding hands. The blood from his hands is watering the flower.